Ilocos Norte Gov. 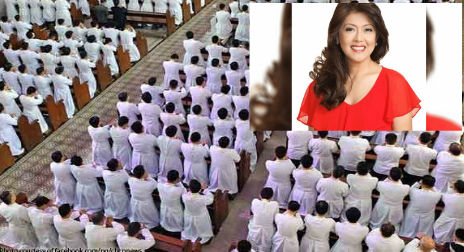 Imee Marcos believes the Catholic Church should do some soul-searching following the arrest of 55-year-old priest and head of a Catholic school Monsignor Arnel Lagarejos after being caught red-handed in driving a 13-year old girl to a motel. The priest allegedly arranged via social media to meet the girl and a pimp outside a shopping mall, where he reportedly paid around 500 Philippine Pesos (£7.49) to take the girl. He faces charges for violating the Anti-Trafficking in Persons Act and an investigation is underway after he was discovered as part of a police entrapment mission. Marcos said the scandal involving the former parish priest of St John The Baptist Parish and president of Cainta Catholic College was just the latest in a string of controversies that have blackened the reputation of the priests from sexual abuse of boys to corruption. Marcos said the Church leaders’ plea not to be hasty in judging Lagarejos, who paid P500 for a sexual tryst with the minor for the third time, sounded familiar to people the Church have criticized for wrongdoing. “These are the reasons why many are disappointed with the Catholic Church and worse, a reason for some faithful to turn their back on the Church. Why is it so easy for the Church to condemn on political issues but it could not even clean its own dirty stuff?” said Marcos in Filipino in her column in Bulgar tabloid. “Priests should look for solutions to these (scandals) and they should not meddle in political matters,” she added. I agree with Governor Imee Marcos. Here is what the Lord Jesus says in Matthew 7:1-5: "Judge not, that ye be not judged. For with what judgment ye judge, ye shall be judged: and with what measure ye mete, it shall be measured to you again. And why beholdest thou the mote that is in thy brother's eye, but considerest not the beam that is in thine own eye? Or how wilt thou say to thy brother, Let me pull out the mote out of thine eye; and, behold, a beam is in thine own eye? Thou hypocrite, first cast out the beam out of thine own eye; and then shalt thou see clearly to cast out the mote out of thy brother's eye."